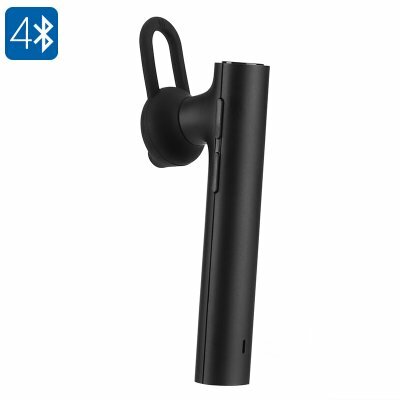 Successfully Added Xiaomi Mi Bluetooth Head Set Youth Edition - CSR8610 Chipset, Bluetooth 4.1, Hands-Free Calls, 98dB, Noise Cancelling (Black) to your Shopping Cart. Enjoy your favorite tracks in absolutely stunning audio quality with the Xiaomi Mi Bluetooth Headset Youth Edition. This extraordinary wireless earpiece features a stylish and comfortable in-ear design – allowing you to comfortably wear them at any occasion. It furthermore comes with three sizes of removable earplugs, ensuring that these earphones form a comfortable fit for anybody out there. Whether you’re out for a walk with the dog, burning some calories out in the forest while mountain biking, or simply are driving your car – with these Bluetooth earphones from Xiaomi you’ll always be able to listen to music. Supporting Bluetooth 4.1, these wireless headphones support quick and stable sound transmission – providing absolutely audiophile-grade music quality at all time. Packing a sophisticated 60mAh battery, these Xiaomi earphones let you listen to music for up to 3 hours in a row - enough to get through your next workout, car ride, or hike through the forest without needing to worry about battery life. Additionally, these wireless headphones can be efficiently used at home or in the office as, with a 10m Bluetooth range, they offer high portability whilst listening to those all time classics. With 98dB sound support and the latest CVC noise canceling technology, this headset allows you to blast those tracks away and lets you listen to every song in your music library without being disturbed by outside noise. Its multifunctional design allows you to conveniently control the volume of your music with the touch of a button. Additionally, it also lets you simply browse through your music library, skip songs, and even answer phone calls without you physically needing to have your smartphone or tablet at hand. With its built-in microphone, these Bluetooth Xiaomi earpieces are not only perfect for listening to music, but also allows you to engage in high-quality hands-free phone calls at any given moment. Perfect for usage in the car or on the bike – from now on you’ll always be able to safely answer your calls while on the move. The Xiaomi Mi Bluetooth Headset Youth Edition comes with a 12 months warranty, brought to you by the leader in electronic devices as well as wholesale electronic gadgets..
Arabic: - سماعة بلوتوث - Chinese Simplified: - 蓝牙耳机 - Czech: - Bluetooth sluchátka - Dutch: - Bluetooth-headset - French: - Oreillette/headset Bluetooth - German: - Bluetooth Headset - Hebrew: - אוזניית Bluetooth - Hindi: - ब्लूटूथ हेडसेट - Hungarian: - Bluetooth fejhallgató - Italian: - Auricolare Bluetooth - Japanese: - ブルートゥース ・ ヘッドセット - Korean: - 블루투스 헤드셋 - Malay: - Set kepala Bluetooth - Norwegian Bokmål: - Bluetooth hodetelefonen - Romanian: - Setul cu cască Bluetooth - Russian: - Bluetooth-гарнитура - Spanish: - Auricular Bluetooth - Thai: - ชุดหูฟังบลูทูธ - Turkish: - Bluetooth kulaklık - Vietnamese: - Tai nghe Bluetooth.